Overlooking the historical center of Rome, the university is located on top of the Janiculum, Rome’s highest hill. With its own garden of umbrella pines it offers a spectacular view of the city and the surrounding hills. The campus is near two city parks, Villa Sciarra and Villa Pamphili, as well as a number of historical landmarks. The area also hosts diplomatic residences and several international academies. The university is an urban campus curently comprising five buildings. The secure and private main campus is formed of two buildings (Building A and Building B), an auditorium and a spacious garden. Building A hosts administrative and faculty offices, student services and the main computer lab whilst Building B has the bulk of the classrooms, laboratories and faculty offices. Evans’ Hall, a liberty villa of 1920 just 100 yards from the main campus, is the site of the library, student lounges and a beautiful garden. Carini 23, a two-minute walk away on Via Carini, is a five story building of the ‘70s and is the location of design studios, faculty offices, and the Batista Multimedia Laboratory, a state of the art film production facility. Via Angelo Masina, an eight minute walk from the main campus, is the latest addition to AUR's extended campus and houses two classrooms and the Art Studios, and offers unrivalled views across the city. There is limited street-side parking available in the area but it is very well served by public transport. Buses Number 75 and Number 44 regularly run directly past the University entrance throughout the day and evening. From Termini Train Station take Bus 75 (direction Poerio/Marino - approx. 20 stops from Termini). From Piazza Venezia take Bus 44 (direction Montalcini - approx 10 stops from Piazza Venezia). 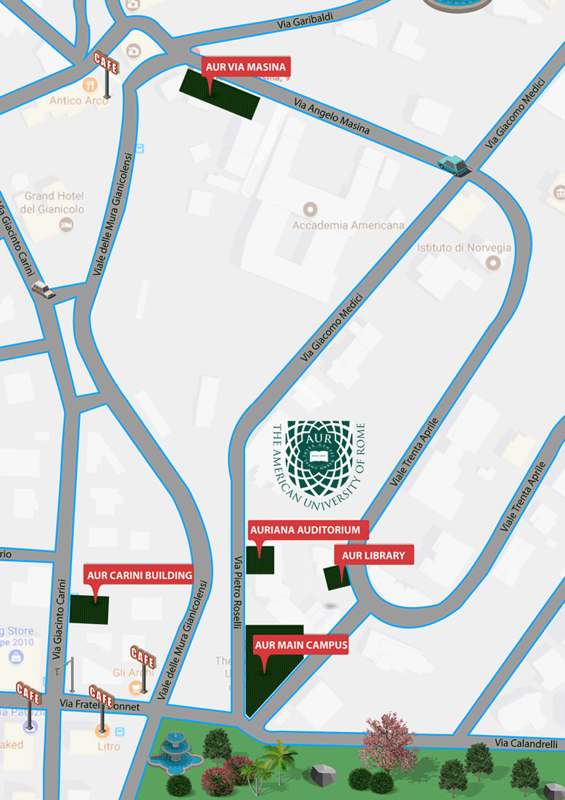 The University is located between the stops Via Dandolo/Calandrelli and Via Giacinto Carini. Either stop is less than 100 meters from the AUR - just walk towards the ancient Roman arches that cross the main road, the University's main gates are directly adjacent to those arches. From the Airport Terminal Railway Station take the Metropolitan Train to the stop “Trastevere Station”. Upon exiting the station, take the Tram #8 in the direction of Piazza Venezia. Get off at Via E. Morosini and catch Bus 44 or 75 that comes up the hill to AUR. Tickets for the train departing from Fiumicino Airport can be purchased from the newspaper stand located near the train and cost €8.00 each way.